While I was at Buffalo Billards for a SXSW event, I ran into Martin Whitmore – which was easy to do because he was the only one with a kilt on at the event (Sorry Ewan, but you were not there). 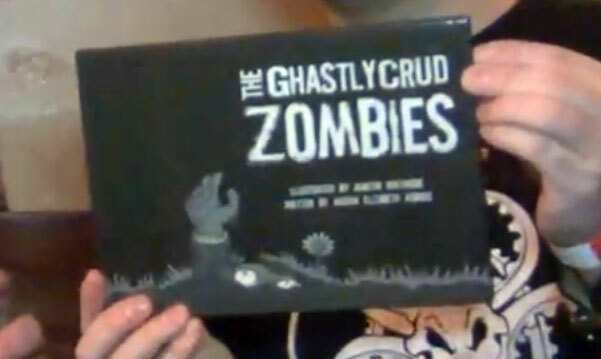 I found out that Martin is an illustrator and ran a successful Kickstarter program for a book – The Ghastley Crud Zombies. Now if you are a fan of Edward Gorey then you will like this book. Whitmore used the similar style to put together a simple coffee table reader on 26 children who had to deal with Zombies. While probably not something to read to the children at bedtime (Whitmore states: You’ll laugh, your children will have nightmares), it is a fun book to page through. I talked with Martin about the book, we had a small reading of it, including the page where M was for Martin – the man with a gun (yup, that’s him!). The book is expected out soon, so watch to see how you might eat up a title (or buy one if you are not a zombie).